CLIMATIC features have a profound influence on soil development. Gentlyfailing rains are better for natural absorption-fertility than sudden heavy downpours.The gentle rains are absorbed into the ground with all their fertility factors. Groundmoisture lasts longer and beneficent decay continues while moisture is present. Thesurplus water percolates underground after the majority of fertility factors arefiltered from the rainfall. All the gases contained in the rain become availablein sufficient or maximum quantities to aid optimum fertility development. Many kindsof basic minerals, organic elements and chemicals are contained in the air. There is every reason to assume that a wide variety of elements arebrought into the soil when rain is absorbed and held long enough to enable the humusof the soil to filter these into itself. In the harsher climatic conditions generally affecting most of theAustralian farming lands, natural absorption fertility does not operate to the extentit does in countries of milder climatic conditions. Moisture losses continuouslyretard decay. Methods of extraction fertility farming act more rapidly to reducesoil fertility to the stage of active soil erosion. Australia, of course, is notalone in this. America and Africa have similar conditions. The causes of erosionare precisely the same in these and many other countries. Just as obviously absorption-fertility farming on these lands willbe more strikingly effective than in the countries of benevolent climatic conditions.If, by every practical means, rainfall is absorbed into the earth and all its fertilityelements held, and if evaporation losses of moisture are retarded greatly and processesof decay continue longer, then these countries of the harsher climates may developmore rapidly in fertility than the others. In such development, the most importanttype of country of all is unquestionably the steeper mountain and hill lands. The effective control and rapid soil developments of these lands willdo much to mitigate the calamitous effects of the worst feature of our climate,.The worst effect of droughts and flood can be fought and conquered by absorption-fertilitymethods of farming and grazing if applied quickly to these steeper lands. At the present time the rapid run off from these lands directly causesuncontrollable and destructive floods, with losses of life, alarming destructionto property and stock, and the choking of rivers and harbours with silt. The trailof havoc extends from the mountains to the sea. In dry, hot weather the steep undeveloped and uncontrolled lands area constant menace with their bushfire hazard. Extermination of rabbits and otherpests is more difficult in these lands. Present recommended orthodox practice is to fence well, stock conservativelyand leave the timber on these steep lands in order to protect them from erosion. The trees of the steep grazing lands of Australia do not of themselvesprevent erosion. Only good management does that. Timbered areas require better managementto protect them than do grasslands. Generally, the present condition of this steeper country is such thatit will not grow both good grass and good timber. A Keyline principle is that planning and development above the Keylinecomes first. This development must be sufficient at least to protect the lower lands. The full development of steep country can only be accomplished rapidlyand effectively if it can be made to pay. The profit must be almost immediate anddefinite--not something in the dim and distant future. The first approach is simply to enable the steep country to absorbthe rain that falls on it and keep it in this condition. Then follow the Keylinemethod of soil improvement for pasture lands. The clearing of this country on the Keyline clearing plan leaves permanenttimber strips that form a guide for Keyline Absorption-fertility cultivation. The full control that this gives will enable the effective controlof bush fires. The parts of this steep country that may be adjacent to an outsidefire risk area can be managed to protect the whole property. It can be heavily grazedor cultivated to form a completely effective fire break. Considerable acreages of this steep country, often regarded as oflesser or almost insignificant value, will be found to develop better pastures thanthe land now considered as the best on the farm. At present, when a farmer leaves his steep country in timber it isusually because he feels he must do so. Sometimes it is left because he really wantsto run it as a forest for profit or for general farm purposes. He thinks then thatthe steep country is the only place for such a forest. In the Keyline developmentof steep country the farmer has the choice. He can develop high quality soil andpasture, or if he wants a forest area he can have this in the steep country or anywhereelse. Australia is, geologically, a very old continent. There are no veryhigh mountains and practically no steep country of long, unbroken slope. By steepslope country is meant slopes of 100 per cent., or a rise or fall of one foot foreach horizontal foot. Many slopes of 100 per cent. do exist, but they are nearlyall short slopes rarely 150 feet long horizontally. These short steep slopes generallyexist as the sudden dip-overs that form the valley heads--the start of the valleys.If the farmer wants some good growing timber he will rarely grow it on this shortsteep country. Much better timber will grow on the flatter country above and below. The clearing of timber on sloping country is dealt with in "KeylineTimber Clearing". Slopes of up to one foot rise in three feet are Keyline developedas described in earlier chapters. Most wheeled tractors will do this safely and well.The three-point hitch and other tractors on which implements are mounted, especiallythose of about 30 horse power, are particularly effective. For short slopes steeper than one in three and up to one in one, arawler tractor and a trailed Graham will provide means for full development of soilfor pasture growth. Keyline cultivation of the type required, up to three workings, isfirst completed above the slope to 30 feet from the steep dip over. The slope isthen plowed directly down hill. The tractor and "plow" make the turn inthe flatter area below and then travel squarely up the steep slope in the same widthof plowing of the downhill work. Turn in the flatter area above and plow directlydownhill beside the plowed ground of the first downhill plowing width. Continue plowingdirectly down hill in new ground and uphill in the plowed land of the previous downhillwidth. By "breaking ground" only on the downhill work and travelling uphillIn the plowed ground, the load on the tractor of the uphill work is reduced to suchan extent that the tractor will handle the implement on the uphill travel withoutcontinuous implement depth adjustment. The whole of the steeper country receivestwo cultivations by this means, and this completes the steep country plowing. The next step is to start from the Keyline and plow the area abovethe Keyline to the bottom of the steep country plowed area. Follow Keyline cultivationparallel to the Keyline on the last run. This land may in a short time grow some of the best pasture on thefarm. Unless it is solid rock, there is probably no country too steep forimprovement if stock will climb it for food. Country that carries some soil, evenif it is very steep, will display significant improvement by Keyline full developmentundertaken in the area immediately above it. It will probably be much richer in theminerals of fertility than land that has been heavily cropped and grazed by methodsthat have not only been extracting fertility but destroying more fertility than theyextract in crop and stock production. Our droughts and flooding rains are factors of prime importance inthe loss of fertility and later in soil losses by erosion. The effects of both are capable of profit producing control, by theabsorption of fertility into the soil of the hill lands. Valleys start or head where a portion of a slope near the top of awatershed or divide becomes steeper than the general slope on either side. Thus thefirst part of a valley formation is steeper than the ridges or shoulders on eachside that form the valley. At some point down the valley--the Keypoint--the valleyslope flattens to such an extent that it becomes flatter than the ridges or shoulderson each side in the same vertical interval. These factors, as already stated, locate our Keylines. The valleyitself and the ridges that form the valley are the two points that require specialcare once the steeper land above has been controlled by Keyline Absorption-fertility.The valley floor has been a danger point for erosion and may have gullies which requirerepair. The shoulders of the valley are usually the driest areas. While the valleys of the usual farming and grazing property, if noteroded, carry more moisture than other areas, they continue to extract ridge moistureeven when the valleys are too wet for healthy growth. 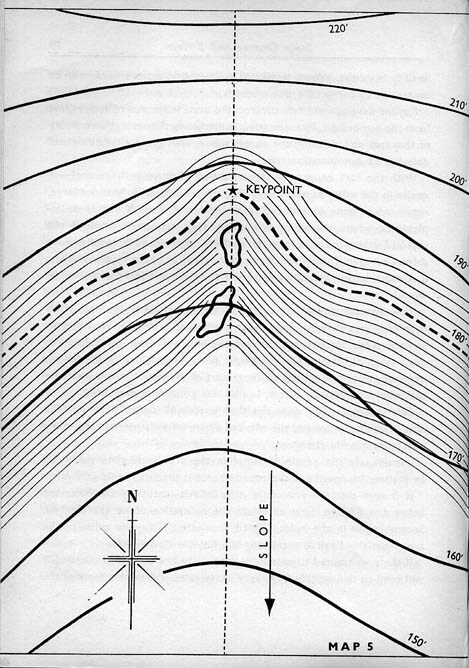 This "dog in the manger"aspect of the valleys is quickly offset by Keyline cultivation. The ridge areas thenreceive and retain their fair share of moisture for longer and longer periods. If the valley is eroded the erosion holes will continue to bleed moistureto the atmosphere until little remains. The effect of this process can be observedwhere every tree of a forest is dying in an eroded valley area. Sufficient has been said in earlier chapters to illustrate the effectivenessof Keyline cultivation in the control and development of absorption fertility invalleys. Where significant gully erosion exists this can also be controlled by correctKeyline methods. Keyline development first controls the usual water run off into valleysfrom the higher land, by tremendously increasing the absorption capacity of thisarea and diffusing the excess water, thus greatly retarding and delaying its concentrationtime. With the high country in this condition effective gully control andrepair in the valley below is simplified. If the hole or gully is not large, repairis best done without the use of bulldozers. Repairs with these implements, wherethe valley soil is not deep, too often result in the topsoil finishing in the holeand a relatively large area of slow-to-improve subsoil remains. This will spoil thelook and value of the repaired valley. A much better procedure is to use the Graham Plow for the repair work. Plow up each side of the valley, allowing one end of the "plow"to drop over into the hole. Spikes with heel sweeps quickly move sufficient soiland subsoil from the banks into the hole and allow the "plow" to crossin all directions. Only sufficient filling or levelling of the hole is necessaryto ensure that the deeper part of the hole is not lower than the valley immediatelybelow. In this way ponding is prevented. This repaired valley does not then expose all subsoil. The soil andsubsoil will be mixed and the effect of a bare infertile patch in the valley willmore quickly disappear. Immediately the repair is complete the area is Keyline cultivatedor pasture improved and the repaired area is practically safe. It is seen that the procedure is as follows--assuming the holes arebelow the Keyline. First complete the cultivation above the Keyline. Second, plowin the holes. Third, immediately Keyline cultivate the area from the Keyline parallelingthe Keyline downward. If the area treated is poor heavy soil, very low in humus content,it will tend to seal quickly from very heavy rains. When this happens the area istreated again both above and below the Keyline on the procedure already discussedfor soil improvement of pasture lands. This is necessary to provide oxygen so thatimprovement will continue. Without oxygen both decay and growth will tend to cease.As the soil improves less cultivation will be necessary to provide aeration and absorption.The improved soil will provide these itself. The great advantage of Keyline aeration cultivation on soil that issealed is sufficient to warrant its use even if a recently sown pasture is stillnew and weak. In these circumstances the cultivation still follows the Keyline procedure.Spikes are to be used and spaced 24 inches apart. One fast run completes the necessaryKeyline aeration cultivation and soil improvement will continue without check. If the erosion holes and gullies in a valley to be Keyline improvedare merely to be "killed" or prevented from getting worse, the procedureis the same except that the Keyline cultivation--that is the final cultivation run--isdivided or split to suit these circumstances. See Map 5. Parallel the Keyline progressively crossing and re-crossing the valleyuntil the first erosion gully is encountered. Then complete the parallel runs downward,working to the gully and back on one side until this side cultivation reaches theend of the hole. Continue the cultivation on the other side of the hole to the bottom--downstreamend--of the hole. The next cultivation run will then be a complete one parallel tothe others and again crossing the valley but now below the hole. All this cultivation running from the erosion hole out and away fromit will have the Keyline drift away from the hole. Only with very heavy rain willwater again run in the gully, and if any further erosion takes place it will be ona greatly reduced scale. With continued Keyline soil improvement it will cease altogether. In times of severe drought the only noticeable green tinge on a grazingproperty will often be the narrow moist strip in a valley. One of the first verynoticeable effects of Keyline development if followed by severe drought conditionsis the greatly widened area of longer-lasting valley greenness. Keyline soon multiplies the effects of the average rainfall. Practically no valleys are safe from erosion under "extraction-fertility"methods of farming and grazing, while under methods of Keyline Absorption-fertilityall valleys, including those of the steeper land, are safe from soil losses and consequentlyerosion. Not only are they safe, which is a negative matter, but they will improveprogressively with all other land in fertility, productiveness and beauty. The use of trees in Keyline planning is discussed elsewhere in thisbook, but a special reference to trees and their effect on valleys can be consideredhere. In the Keyline development of land, trees are not generally left invalleys except as part of a Keyline or Guideline timber strip. The eddying of watercaused by a tree in the path of the water flowing down a valley will often commencean erosion gully. The breaking of the soil round a tree from root movement and growthcan also be a contributing factor. Stock sheltering beneath a tree tends to powder the soil around it,thus causing soil movement when water flows down the valley. The effect of both these erosion hazards will be quickly offset byKeyline improvement. It is still advisable to clear the valley timber except whena Keyline or Guideline timber strip crosses the valley. Stock will not damage thistimber which is left in a valley as part of a timber strip crossIng the valley. The Keyline development of valleys is simpler and more rapidly effectiveif there are no odd trees to consider. It has been noted that a mob of cattle in a large paddock containingthree timber strips at different levels invariably all camp in the one timber stripand spread themselves well along the line of this belt. A night or two later theywill be together maybe in a higher or lower timber strip.